Used for boiler feed water tank temperature control. The instrument is very easy to see and useful. It was easy to install and saved. This review is about item#32794973. Although the intended use is not specified and purchased, the reaction of the temperature change is slow. You can not adjust the temperature while viewing the display. It is used for hot air drying at 100 ° C or more. I am satisfied with the amount of money because letters are easy to see. It was as good as existing products. 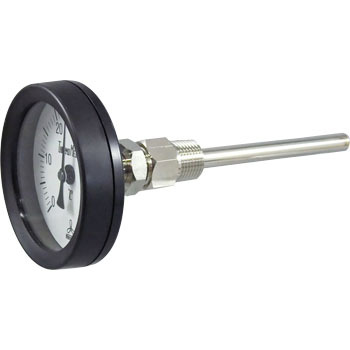 The dial is easy to read, the indicated temperature is accurate. This review is about item#32794955. Reaction speed is unexpectedly faster and feel good compared to measurement temperature. However, this product is an indoor specification, it can not be used outdoors, but the description is said to be unfriendly at all. There is description that there is a sealed type outdoor use in the instruction manual of the purchased product, and you should also mention that this product is for indoor use in the description of this product. This review is about item#32794964. The appearance seems to be sturdy, the numbers are large and easy to understand, the manual and construction were easy. The length of the temperature-sensitive part reaches the flow path of hot water at 100 mm, it is convenient to measure the temperature promptly.